Renting a prom tuxedo may be the most difficult thing you have to do in preparation for the event. Luckily, even that isn't complicated. Guys have it easy when it comes to getting ready for prom -- find a date, pay for the tickets and transportation, and rent that tuxedo. When it's time to rent the tuxedo, the salesperson will measure you and show you your basic tuxedo options and additional accessories. Decide which look you like best and whether it will fit your budget, and voila--done in relatively little time! Okay, so you've figured out that you need a tuxedo rental, what's next? Head to your nearest tuxedo shop and let the salesperson find what is right for you. Your best bet in finding a good tuxedo shop would be to start at your local men's suit store such as Men's Wearhouse or After Hours Formalwear. Make sure you have a professional helping you pick out exactly what you want. If you go in with a budget and stick to it, you won't feel like you've been ripped off when you're done. Tip: Rent your tuxedo at least a month before prom. Getting measured for a tuxedo doesn't take longer than a few minutes. If you take your measurements at home, have someone help you (like your mom). Include your height and weight when ordering your tuxedo. Also, tuxedo slacks are not worn below the waist, so take that measurement at the naval. Tip: Measurements should not be more than 30 days old. 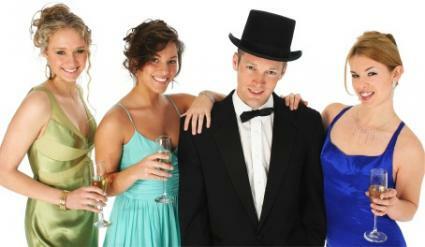 The average tuxedo rental starts at around $50 without accessories. The cost can be as high as $150 or more if you are including any accessories. Consider this: Guys really should rent tuxedo shoes for prom. Nothing looks worse than an old pair of scuffed dress shoes with a fancy new tuxedo. It's worth the investment. You don't have to get the traditional black tuxedo. But that doesn't mean you should go for the 1970s powder blue tux. You could choose a charcoal gray or even go lighter than that (or go with navy, burgundy, etc). Pair it with a dark shirt for an unexpected look. If you go with a classic cut, changing up the color scheme a little won't leave you looking too out of place. Take a look at Taylor Lautner for proof. If you're more comfortable in a punk look or something that says you're too cool for traditional prom tuxes, skip the vest and wear a patterned shirt with a skinny tie under your classic tux. Take or leave the Converse sneakers. Seventeen.com uses Jackson Rathbone to demonstrate how fantastic a monochromatic look can be. The dark gray tux, black shirt, and shiny black tie work well together, and you won't look like everyone else at the prom. If you want to go completely traditional with a preppy look, go all out with the dark (usually black) tux with a vest. Wear a tie and a white shirt. Don't forget the Oxfords. Color coordinate: This one's always a possibility. If your date has her dress, you can start building your tux based on a matching vest and tie color. From there, find a tux color that coordinates well. Prom is a big event and it should be celebrated as such. Go all out for it and don't treat it like it doesn't matter. 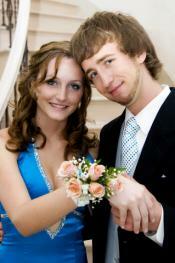 You and your date will have a better time if you take the time to get a great looking tux and get yourself spruced up.